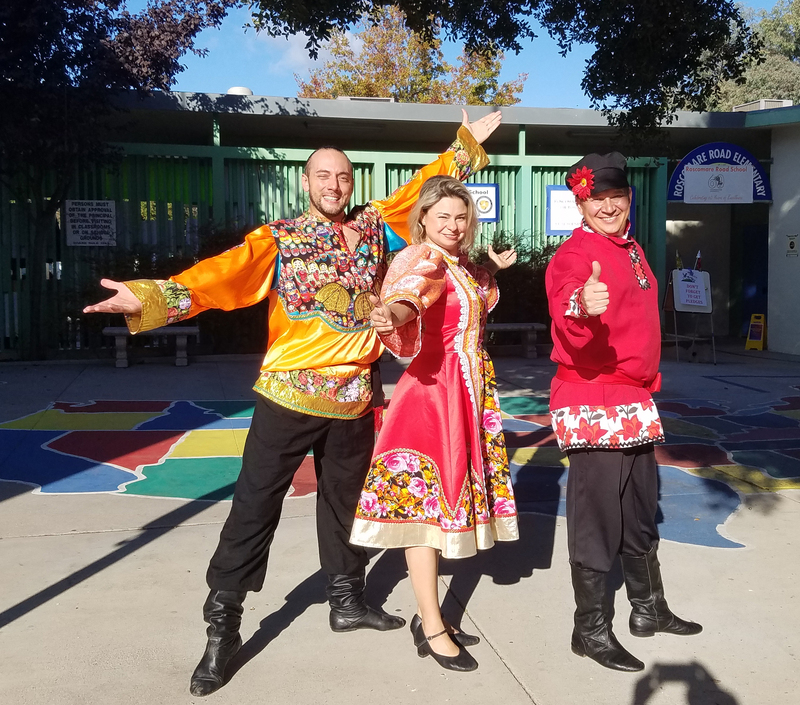 New York based ensemble Barynya offers Russian dance and music program for multicultural school assemblies in California, Arizona, New Mexico, Oregon, Texas, New York, New Jersey, Pennsylvania, Connecticut, Maryland, and other states. 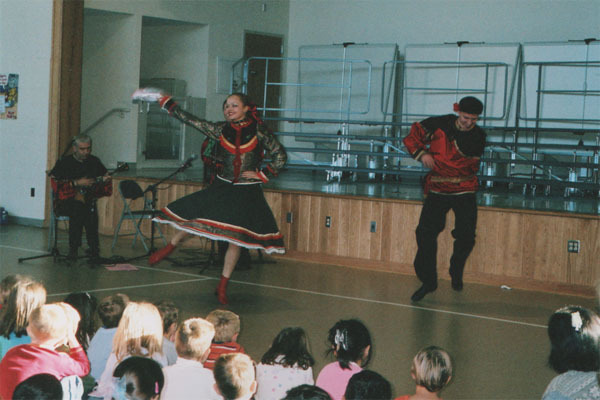 Barynya provides colorful educational performance with two, three or more dancers, one, two or more musicians and singers. 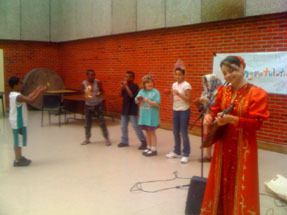 The program of the show included Russian, Ukrainian, Cossack, Jewish, Gypsy dances and songs, live performances on balalaika (Russian traditional string instrument), garmoshka (Russian folk button accordion), and guitar. 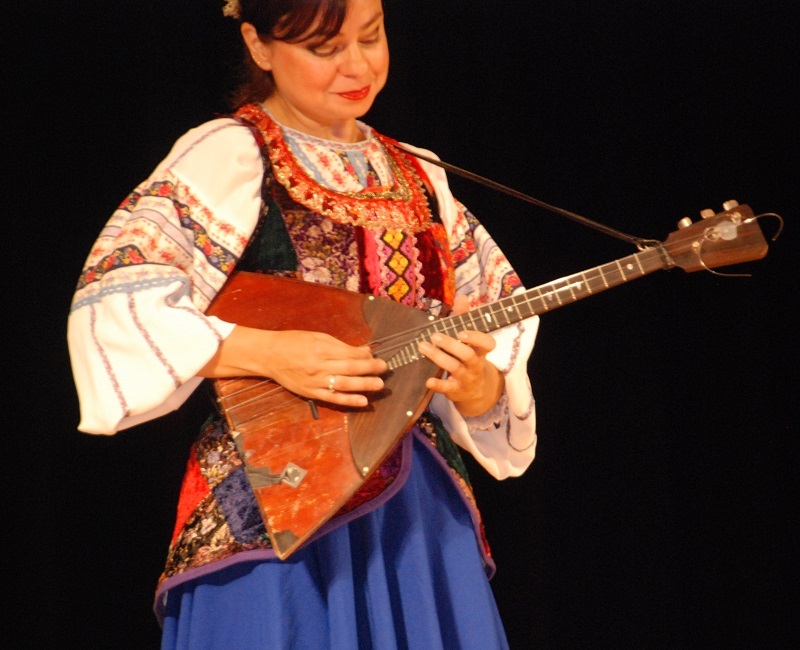 Russian ethnomusicologist, singer, musician, artistic director/founder of the Barynya ensemble Mikhail Smirnov (garmoshka, guitar, vocals) leads the performance by giving a short explanation of every number of the program in English. He talks briefly about costumes, folk instruments, Russian traditions, explained the difference between Russian and English alphabet, and performs Russian songs and Tongue-Twisters. 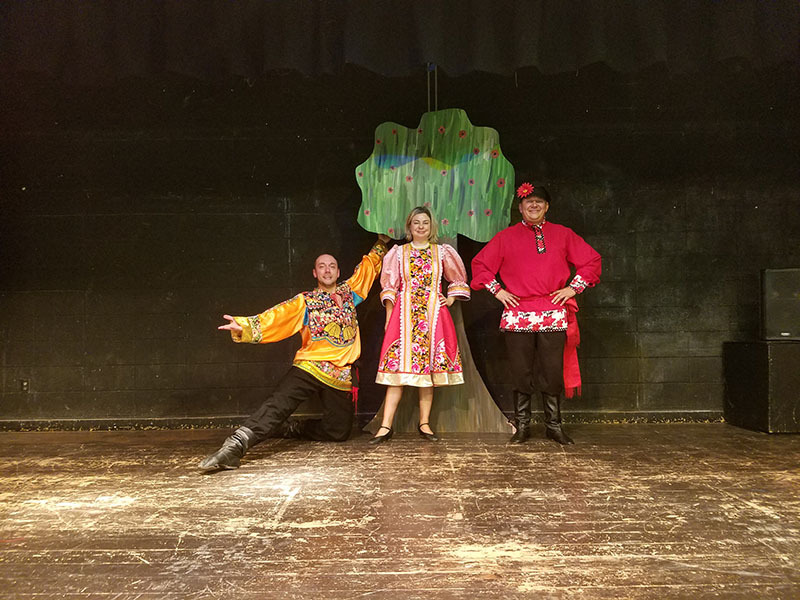 In between numbers of the show Mikhail Smirnov shares a little bit of the Russian language with the students. 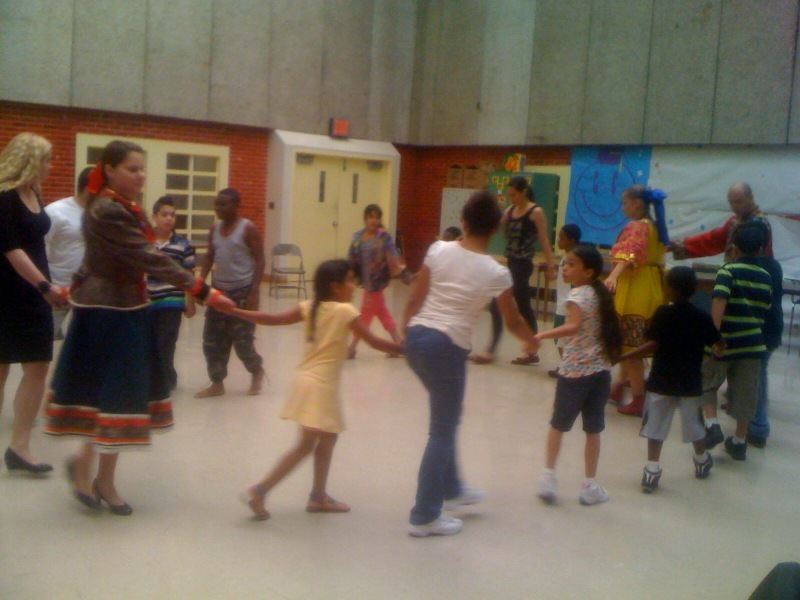 He teaches them phrases such as "Thank You" (SPASEEBA), "Hello" (ZDRASTVUITE), "You're Welcome" (PAZHALUYSTA), "Bye" (PAKA) as well as the alphabet and counting. He says each word in English and then slowly in Russian, allowing the children a moment to try the words themselves after each one. After the segment on words, the students attempt to chatter in Russian for a couple minutes, smiling and laughing about how they sounded. Almost in the end of the performance, Mikhail pauses to share a couple of Russian Tongue-Twisters, explaining each one in English first, and then saying them in Russian at top speed. With each one, the twisters got more complicated and lengthy. 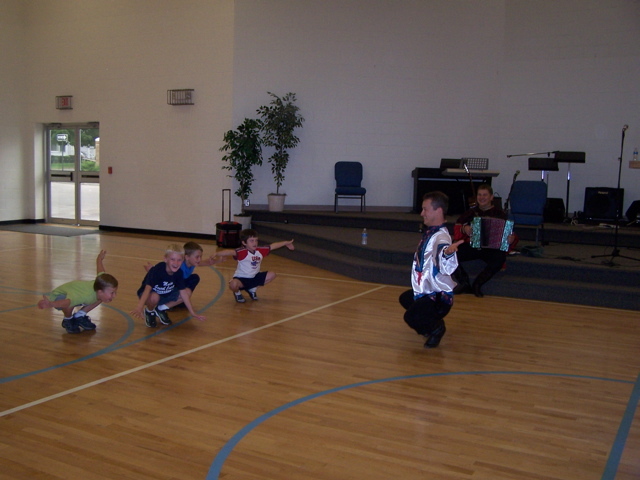 There was even a chance for all students to try out moves of Russian dance BARYNYA. 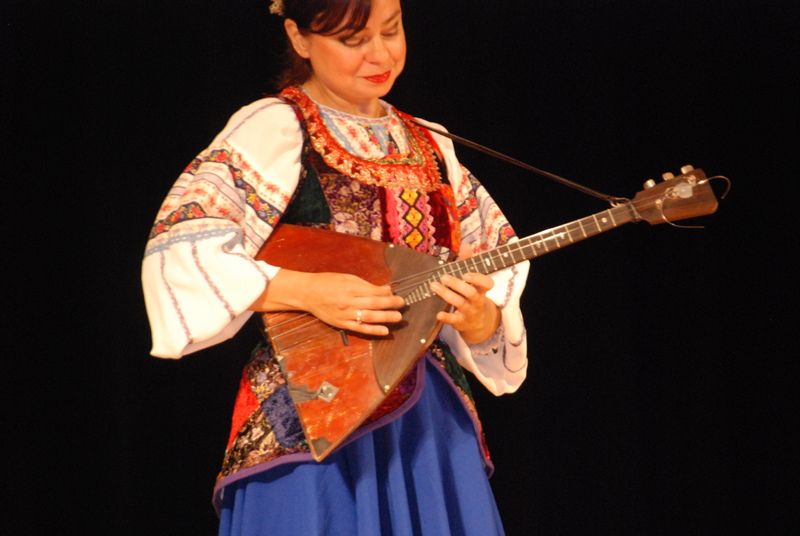 Musical director of the group Elina Karokhina plays a few solos on Russian folk instrument balalaika, she also dances Russian, Jewish, and Gypsy dances. Dancer Serhiy Tsyganok performes Russian dances Barynya, Kalinka, Cossack dance, Ukrainian dance, Jewish Bottle dance, and Russian Gypsy dance. 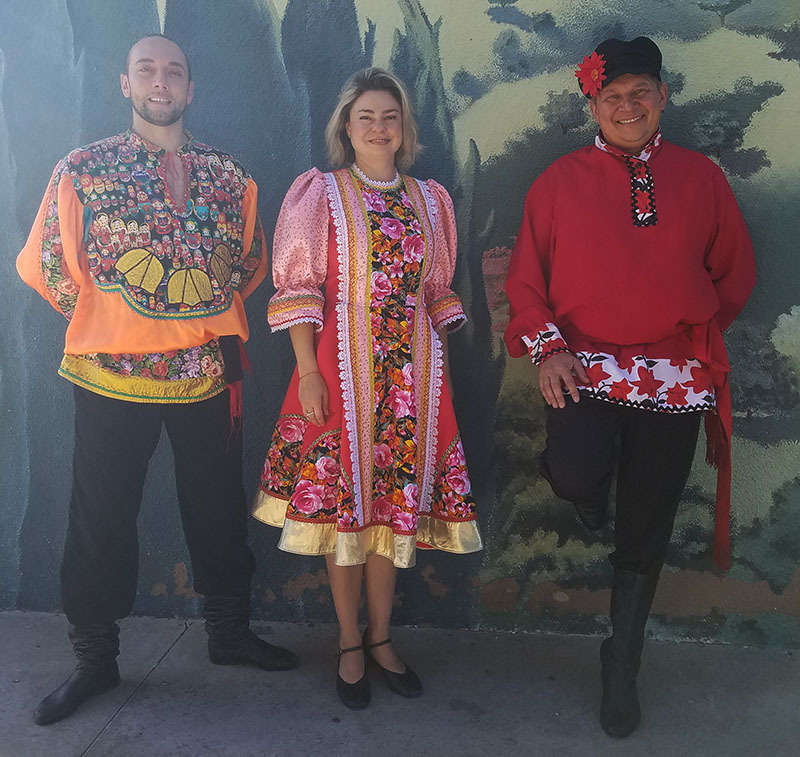 Russian dance and music ensemble Barynya (established in 1991) is available for hire for Performing Art Centers, school assemblies, festivals, colleges, libraries, concert halls, restaurants, private and corporate events as one powerful ensemble or in smaller groups. Contact information: email msmirnov@yahoo.com, phone/text (201) 981-2497. Dancer Serhiy Tsyganok was born in L'viv, Ukraine in 1982. 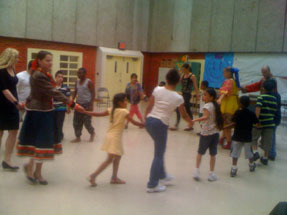 He started dancing with kids' folk dance ensemble "Iskorka" under direction of his mother Liliya Yurievna Tsyganok. 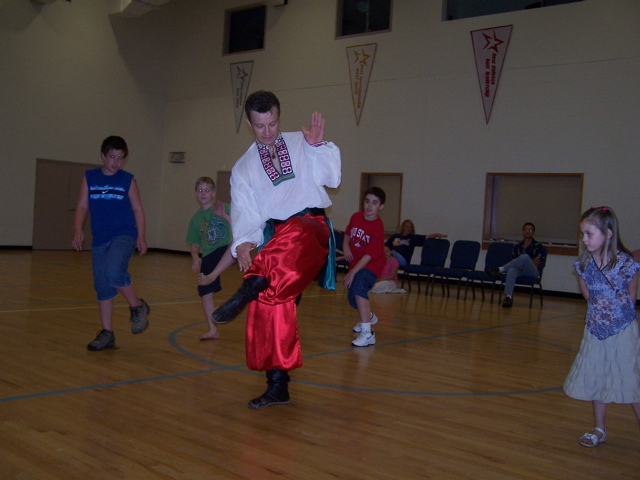 In 1996 he started dancing with teens' traditional Ukrainian dancer troupe "Karpaty" under direction of Honored Artist of Ukraine Mihailo Vanivsky. From 1997 through 2002 he stadied dancing and choreography at the L'viv State College of The Culture and Arts. 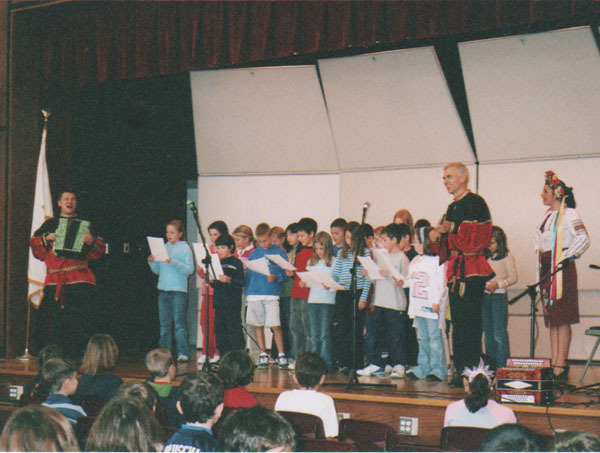 Graduated in 2002. 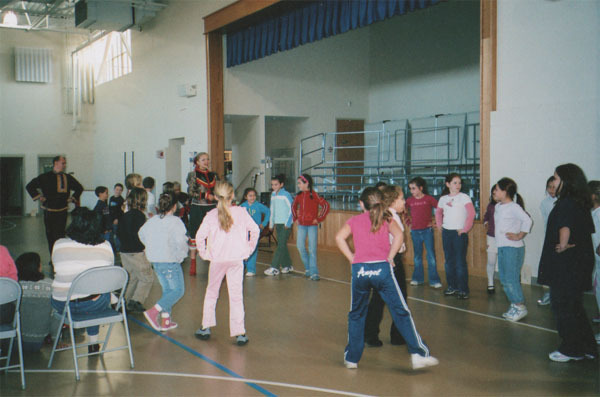 At the same time as he was a student at the L'viv State College of The Culture and Arts he was dancing with Jewish Dance Ensemble "MAZAL TOV" and Polish Dance Troupe "L'vovyatsy". 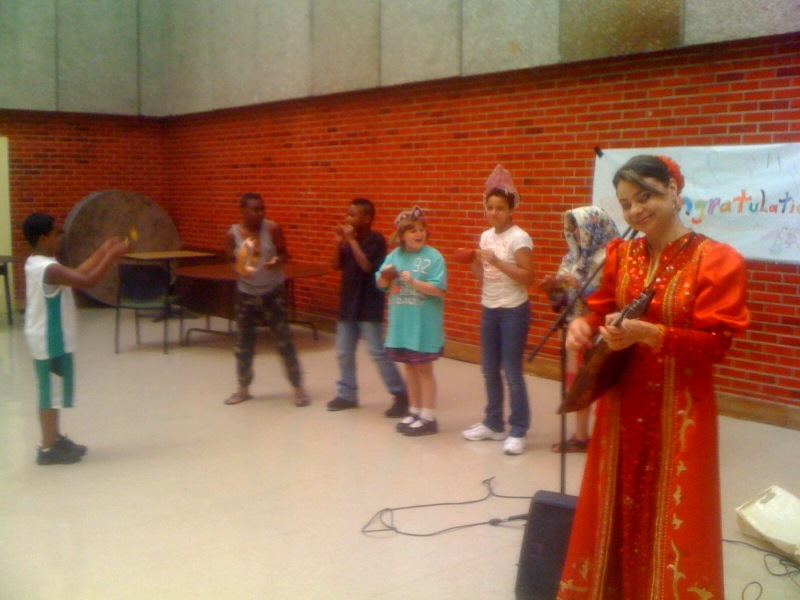 With "MAZAL TOV" and "L'VOVYATSY" groups Serhiy performed locally in Ukraine, and internationally. 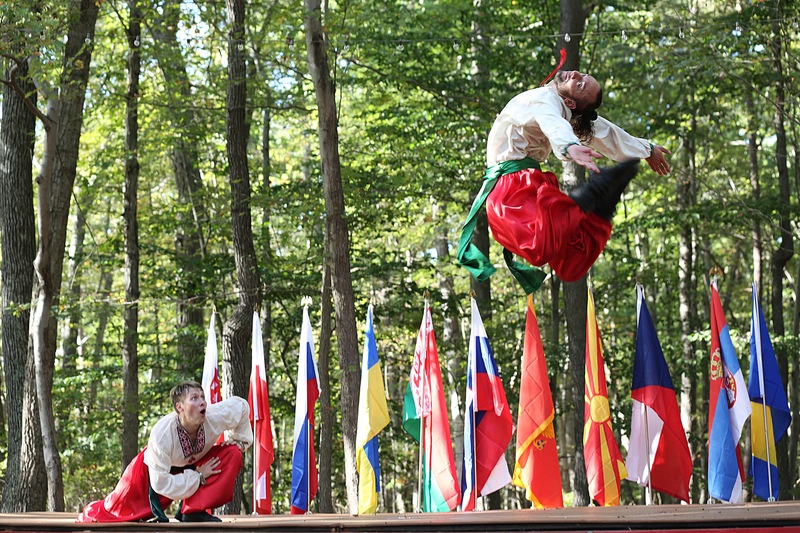 In 2003 he graduated with Diploma of completion special training in Polish Traditional dancing from Lyublin's University of Maria Skladovsky in Poland. 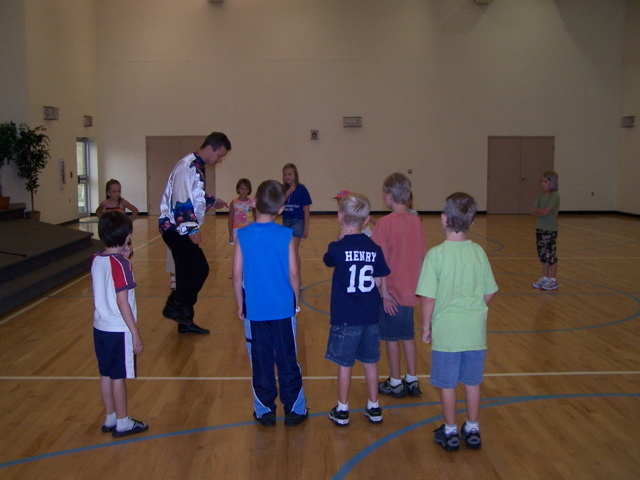 In 2003 Serhiy joined dance troupe to work 18 months contract with the show Sharm L Sheikh in Egypt. In 2006-2012 he was performing with various dance projects in Turkey, Israel and Dubai. In 2013 he started working as a dancer on cruise ships all over the world. In the summer 2014 Serhiy made his home in the United States of America. 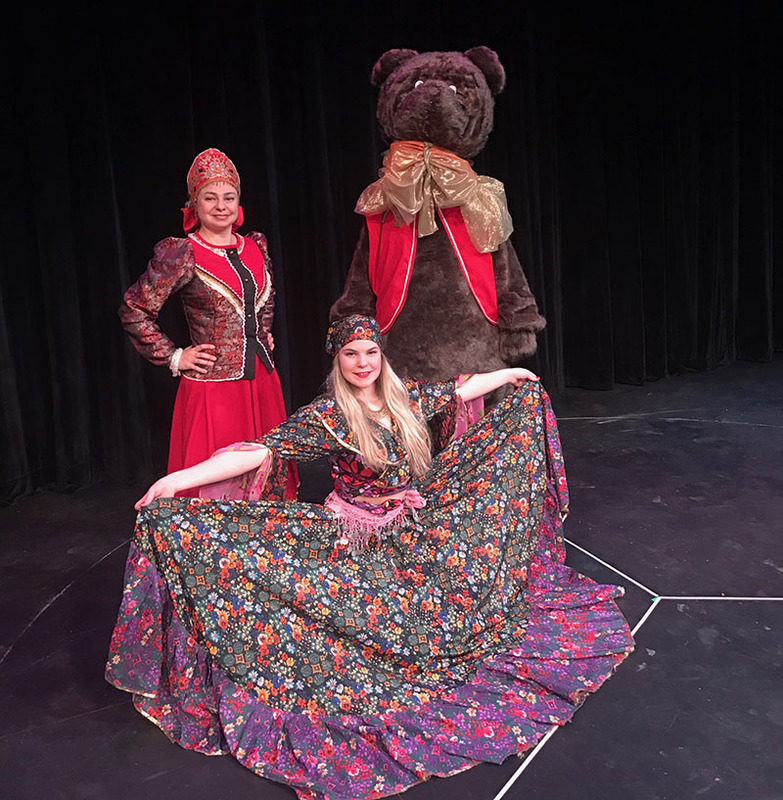 He started working with various Ukrainian groups, dance and music ensemble Barynya, Moscow Gypsy Army, Can-Can Cabaret Dance Show, and others. Serhiy speaks Ukrainian, Russian, Polish, and English. 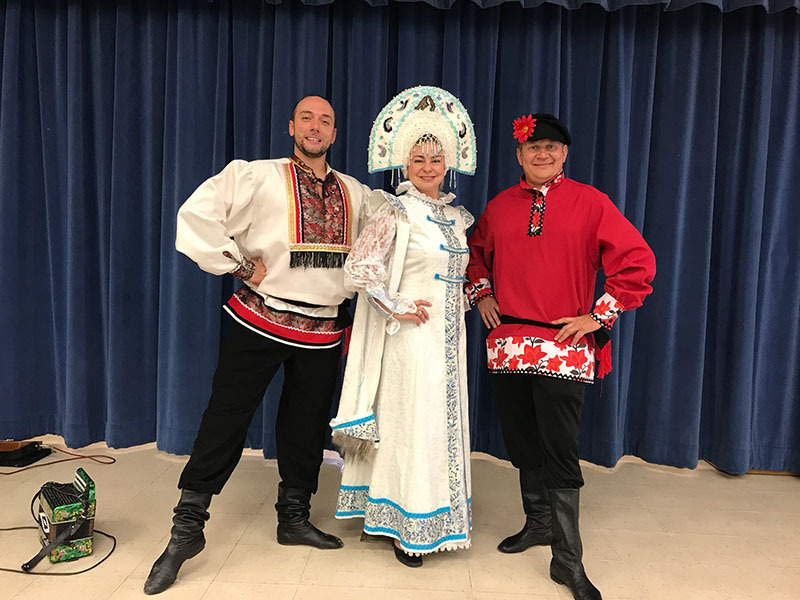 Dancer Serhiy Tsyganok is performing Ukrainian folk dance "Hopak"
Balalaika virtuoso Elina Karokhina plays Russian folk song "Kamarinskaia"
Dancers, musicians, and singers of Barynya ensemble in Bloomingdale, Canada, Toronto, Canada, Winnipeg, Canada, Chino Valley, AZ, Dateland, AZ, Mayer, AZ, Oracle, AZ, Peoria, AZ, Phoenix, Arizona, October 2017, Phoenix, AZ, March 2013, Tucson, AZ, January 2017, Tucson, AZ, October 2017, Alameda, California (CA), Altadena, CA (2013), Altadena, CA (2017), Belmont, CA, Сamarillo, CA, Сeres, CA, Chatsworth, CA, Coalinga, CA, Corcoran, CA, Crescent City, CA, El Monte, CA, Farmersville, CA, Fresno, CA, Georgetown, CA, Hanford, CA, Happy Camp, CA, Hayward, CA, Hidden Valley Lake, CA, Hillsborough, CA, Kenwood, CA, Lincoln, CA, Lomarica, CA, Los Angeles, CA, Los Gatos, CA, Meadow Vista, CA, Mendota, CA, Moreno Valley, CA, North Highlands, CA, Oceanside, CA, Oxnard, CA, Pasadena, CA, Placerville, CA, Port Hueneme, CA, Poway, CA, Rancho Palos Verdes, CA, Ripon, CA, Roseville, CA, Sacramento, CA, Salida, CA, San Jose, CA, San Leandro, CA, San Mateo, CA, Santa Ana, CA, Santa Barbara, CA, Santa Rosa, CA, Seiad Valley, CA, Spring Valley, CA, Sun Valley, CA, Sunnyvale, CA, Temecula, CA, Thousand Oaks, CA (2013), Thousand Oaks, CA (2017), Tracy, CA, Turlock, CA, Ukiah, CA, Walnut Creek, CA, West Hills, CA, Windsor, CA, Yreka, CA, Yuba City, CA Brighton, CO, Denver, CO, Colchester, CT, Darien, CT, Eastford, CT, Enfield, CT, Greenwich, CT, Greenwich, CT 2015, Middletown, CT, Norwich, CT, Plainfield, CT, Stamford, CT, Stratford, CT, Stratford, CT, Taftville, CT, Weston, CT, Wolcott, CT, Woodstock, CT, Washington, DC, Cape Coral, FL, Cape Coral Lee County, FL, Clearwater, FL (November 2015), Stetson University, DeLand, Florida, Delray Beach, FL, Estero, FL, Fort Myers, FL, Lehigh Acres, FL, Miami, FL (Dec 2015), Miami, Florida (2013), Micco, FL, North Fort Myers, FL, Orlando, FL, Pine Island, FL, Plantation, FL, Sarasota, FL, St.Petersburg, FL, Venice, FL, West Palm Beach, FL, Lahaina, HI, Lamoni, IA, Elk City, ID, Arlington Heights, IL, Batavia, IL, Medinah, IL, Oak Park, IL, Princeton, IL, Quincy, IL, Bloomington, IN, Brookville, IN, Columbus, IN, Evansville, IN, Laurel, IN, Lebanon, IN, Shelburn, IN, Shelbyville, IN, Colony, KS, Eureka, KS, Gardner, KS, Beechmont, KY, Jackson, KY, Lexington, KY, Morehead, KY, Pikeville, KY, Stanton, KY, Bastrop, LA, Tallulah, LA, Agawam, MA, Boston, MA 2015, Cape Cod, MA, Chestnut Hill, MA, Gardner, MA (2013), Stoneham, MA, Topsfield, MA, Townsend, MA, Annapolis, MD, Arnold, MD, Baltimore, MD (2017), Baltimore, MD (2014), Wedding George Peabody Library, Baltimore, MD, Bel Air, MD, Easton, MD, Finksburg, MD, Joppa, MD, Largo, MD, Laurel, MD, Ridge, MD, Rockville, MD, Sandy Spring, MD, Silver Spring, MD, Tilghman, MD, Bowdoin College, Brunswick, Maine, Bristol, ME, Portland, ME, Detroit, MI, Holland, MI, Kalamazoo, MI, Petoskey, MI, Rockford, MI, Taylor, MI, Westland, MI, Florissant, MO, Gorin, MO, St. Louis, MO, Jefferson Memorial, St.Louis, MO, Canton, MS, Union, MS, Asheville, NC, Chapel Hill, NC, Kill Devil Hills, NC, Kitty Hawk, NC, Mocksville, NC, Fairbury, NE, Omaha, NE, Center Sandwich, NH, Wolfeboro, NH, Far Hills, NJ, Fort Lee Public library concert, Freehold, NJ, Gladstone, NJ, Mahwah, NJ, Monroe, NJ, Toms River, NJ, Farmington, NM, Fruitland, NM, Lovington, NM, Milan, NM, Henderson, NV, Wedding Las Vegas, NV, Las Vegas, NV, Albany, NY, Albion, NY, Amitvylle, NY, Avon, NY, Brooklyn, NY, Buffalo, NY, Geneseo, NY, Holbrook, NY, Jeffersonville, NY, Lake Ronkonkoma, NY, Nanuet, NY, New Rochelle, NY, Carnergie Hall, NYC, Plattsburg, NY, Purchase, NY, Queens, NY, Rego Park, NY, Riverhead, NY, Rochester, NY, Scotia, NY, Slate Hill, NY, Somers, NY, Southampton, NY, Staten Island, NY, Watertown, NY, Westhampton Beach, NY, Akron, OH (July 2015), Cincinnati, OH 2013, Cincinnati, OH 2016, Cleveland, OH, Likeside, OH, Warren, OH, Lincoln Elementary School, Corvallis, Oregon, The Dalles Middle School, The Dalles, OR, Deep Creek Damascus K8 School, Damascus, OR, Danebo Elementary School, Eugene, OR, Eugene, OR, Matryoshkas, Russian dancers Duo, Eugeine, OR, Slavic Festival, January 2006, Eugeine, OR, Slavic Festival, January 2007, Gold Beach, OR, Klamath Falls, OR, Portland, OR, Russian Gypsy Punk-Rock band Miru-Mir-Chervona, Richmond Japanese Immersion, Portland, OR, Riddle, OR, Sheridan, OR, Adams County Heritage Festival in Pennsylvania, Aston, PA, Doylestown, PA, Du Bois, PA, Dunmore, PA, Erie, PA (Troika Fest), Gettysburg, PA, Houtzdale, PA, Lake Como, PA, Lansdale, PA, Millerstown, PA, St. Marys, PA, Aguadilla, PR, Cayey, PR, San Juan, PR, Clayville, Rhode Island, Charleston, South Carolina, Florence, SC, Lancaster, SC, Latta, SC, Mt. Pleasant, SC, Memphis, TN, Amarillo, TX, Dallas, TX, Fort Worth, TX, Ira, TX, San Antonio, TX, Waco, TX, Arlington, VA, Big Island, VA, Earlysville, VA, Fairfax, VA, Harrisonburg, VA, Lynchburg, VA, McLean, VA, Radford, VA, Spotsylvania, VA, Everett, WA, Olympia, WA, Seattle, WA, Seattle, WA 2013, Wilkeson, WA, Dodgeville, WI, Kenosha, WI, Livingston, WI, Morgantown, WV, Sand Fork, WV.